The Redrock DSLR Field Deluxe Cinema Bundle is a comprehensive package for converting video DSLRs to useful cinema production rigs. This rig is ideal for DSLRs that have the ability to output an HD picture to an external monitor while recording. 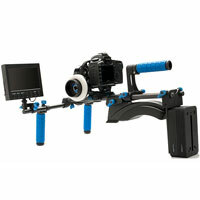 - click for more details on Redrockmicro Field Cinema Deluxe DSLR Rig V2. The eyeSpy line of DSLR rigs are ideal for any filmmaker who wants a shoulder-mounted ergonomic support system for their DSLR. The eyeSpy Balance Bundle builds on the Standard Bundle by adding counterbalance weights for a perfectly balanced, on-the-go, shoulder-mounted DSLR rig. The eyeSpy Balance is a good mid-range solution bundle within the eyeSpy line. 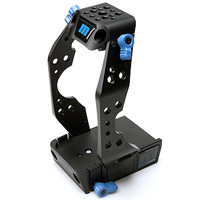 Redrock Micro eyeSpy Balance is available for hire from RENTaCAM Sydney. The Redrock DSLR Field Standard Cinema Bundle is a comprehensive package for converting video DSLRs to useful cinema production rigs. This rig is ideal for DSLRs that have the ability to output an HD picture to an external monitor while recording. Having an HD monitor opens new doors like the ability to allow a Camera Assistant to pull focus as opposed to the operator. It also allows users to take full advantage of the features that professional HD monitors offer. The DSLR Field Cinema Bundles are similar to the eyeSpy rigs. The Field Cinema Bundles use an external monitor for framing and focus, where the eyeSpy bundles offset the camera for use with an eyePiece. - Maintains complete access to your camera’s buttons and ports. The ultraCage™ is the first support cage designed specifically for the Canon EOS C100 digital cinema camera, and has been called the essential accessory for transforming these phenomenal standalone cameras into phenomenal production cameras. The ultraCage™ delivers all the needed pieces for mounting, accessory support, stability, and modularity to fulfill the promise of the C100. As with all Redrock products, the ultraCage™ delivers professional quality and features. Redrock Micro ultraCage for Canon EOS C100 cinema camcorder is now available for hire or rent from RENTaCAM Sydney. 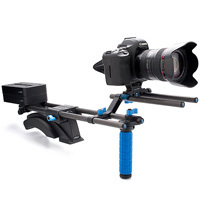 - ultraCage baseplate designed specifically for the Canon EOS C100 digital video camera. - Form-fitting Canon EOS C100 cage including side arms and top plate. 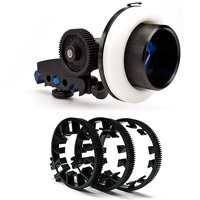 The microFollowFocus | Blue is a new generation of follow focus units that lead the way in price/performance. The | blue line incorporates new designs and technologies to deliver an incredibly solid, accurate, highly repeatable follow focus ideal for any level of production. The microFollowFocus | blue can be used with still lenses (with proper gearing such as our microLensGears) and cinema lenses. The Redrock microFollowFocus is the first complete follow focus system optimized for SLR lenses. Redrock Micro follow focus is available for hire from RENTaCAM Sydney. The microFollowFocus Complete Package is a comprehensive package including virtually everything needed in a follow focus system. 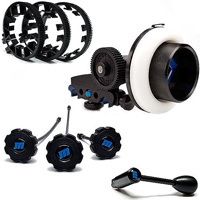 It adds popular accessories including the microSpeedCrank and set of whips, which allow a second operator to easily pull focus without interfering with camera operations. Zacuto’s DSLR baseplate is an adjustable and expandable baseplate that allows the use of 15mm accessories - follow focus and/or matte box - on your HDSLR camera. Allen screws in the front of the baseplate adjust the height of the plate for compatibility with all DSLR cameras with and without battery grips. 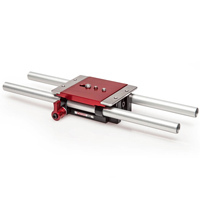 Zacuto DSLR baseplate is available for hire from RENTaCAM Sydney. The Zacuto Mini Baseplate with is a baseplate for smaller cameras like DSLRs, the Sony FS700 and the Blackmagic Cameras. 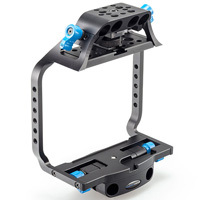 This baseplate features 1/4" and 3/8" camera mount screws and tripod mount threads and has a removable locking pin. 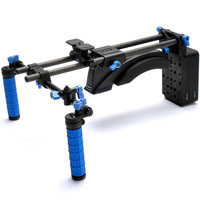 It's adjustable along the included 12" rods at the pull of a spring loaded lever and also vertically for alignment with matte boxes and follow focuses. 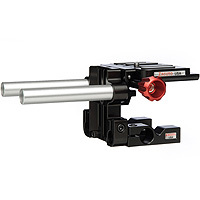 Zacuto Mini baseplate is available for hire from RENTaCAM Sydney. 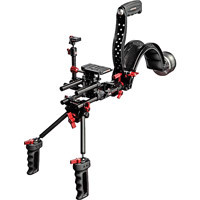 Zacuto Scorpion DSLR Shoulder Rig - COMING SOON! 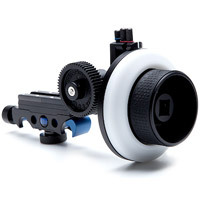 The Zacuto Scorpion DSLR Shoulder Mount is designed to make shoulder-mounted DSLR video shooting easy and comfortable. 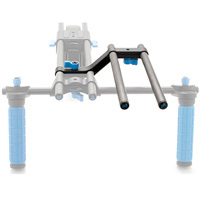 It features a curved, form-fitting silicone gel shoulder pad that connects to the back of the baseplate with two 2" M/F rods. The rods screw into the back of the included DSLR baseplate and connect to the front of the shoulder pad via 15mm quick release ports, making it fast and easy to switch from shoulder mount to tripod and back.